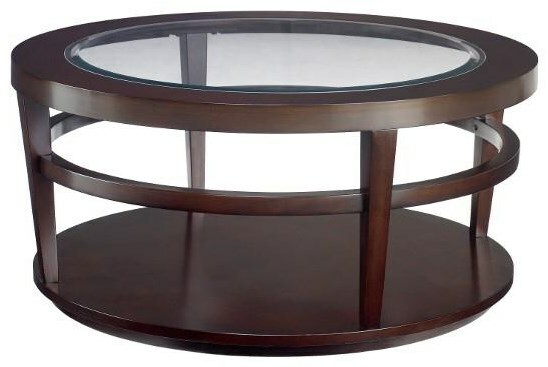 Create an attractive and unique focal point for your living area with this cocktail table. 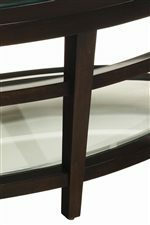 The oval-shaped occasional piece carries a rich merlot finish and features a lower shelf, which is great for keeping books, magazines, remote controls and vases while the beveled glass top insert provides your room with depth. Plus, the castered bottom allows for easy mobility. There will be plenty to like about this attractive coffee table in your home decor. The Urbana Cocktail Table by Hammary at HomeWorld Furniture in the Hawaii, Oahu, Hilo, Kona, Maui area. Product availability may vary. Contact us for the most current availability on this product. Handles & Hardware Burnished knob pull hardware is found on the entertainment console in this collection. Case Detail Clean geometric edges, with straight square legs. Description: Top Tempered and beveled glass panel drop in inserts. Make a smart choice for your living room decor by bringing the Urbana collection into your home. Sleek and simple, quality and character, this collection has it all. A rich brown finish nicely complements the use of sizable glass shelving throughout the occasional tables, increasing the passage of light, and feeling of space in your home. Clean lines and functional, modern styling come together, mixed with thorough functionality in the creation of display and storage for your home. The Urbana collection gives your home the touch of flare and fresh styling it deserves. The Urbana collection is a great option if you are looking for Contemporary furniture in the Hawaii, Oahu, Hilo, Kona, Maui area.